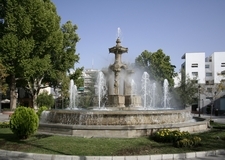 Welcome to this guide of Granada offered by Andaluciacar.com. We have included a full list of information about Granada. Moreover, this website has information about other cities of the province of Andalucia and Costa del Sol. Navigate from one city to other using the menu at the right of this website. If you are new here you will see that Andaluciacar.com incorporates an easy navigation method using a top menu containing the most important areas. Any different section will be split into other sections any time you click on them. These submenus appear at the end of the pages as you can see at the end of this page. There are many different areas in this website about this city and the best places to visit as well as we will give you some information about renting a car and the best rates. Granada is the capital city of the Province of Granada and old capital city of the medieval Kingdom of Granada. Its population is 237.929 habitants and 472.638 in the metropolitan area. It is located next to the Sierra Nevada Mountains in Andalusia in the south of Spain. It is about 70km from the coast. Being in this position means that it is possible to go skiing and sunbathe on the beach in the same day. In January there are lots of blue skies and it is warm when the sun is shining but it gets cold at night. There are occasional frosts. The best time to visit Granada is in the spring and autumn when the temperature is just perfect with warm sunny days. During July and August it can be very hot and some days the temperature reaches 40C. Granada has a dry heat which is much more bearable than the humid heat which you will find in Barcelona. There is very little rainfall although every few years there are spells when it rains very heavily. The most important place to visit in Granada is the the Alhambra. It is a Moorish citadel and palace and it is one of the most famous items of the Muslim, Jewish, and Christian historical legacy that makes Granada a hot spot among cultural and tourist cities in Spain. The Almohad urbanism with some fine examples of Moorish and Morisco constructions is preserved at the part of the city called the Albaicin. You can appreciate the splendour of this fascinating building at the following image. The Alhambra is considered by some to be one of the 10 wonders of the world. It is a massive castle constructed over many centuries. It consists of gardens, fortifications and sumptuous palaces. Granada is also well-known within Spain due to the prestigious University of Granada and, nowadays, vibrant night-life. In fact, it is said that it is one of the three best cities for college students. The following list of important information can be very usefull when staying at Granada. It includes info about guided tours, consulates and any important telephone number that you must know before visiting Granada. Tel: 958 221 022 and 958 225 990. (next to the ticket offices). Entrance from the dual carriageway, exit 130, towards la Chana. Palace of Dar al Horra. Sat. 10am–2pm. Free educational tours through the Albaicín by appointment. Barranco de los negros (next to la Chumbera). Cicerone: daily departure with no prior booking. Tour of the historical centre. Meeting point: Plaza del Carmen, by the Town Hall. Time: 10.30 am (from April to October). Types of admission: general and free for children under the age of 12. Tel: 670 541 669. Granada trains timetables and contact information. Latest Sierra Nevada tourist information. More information about buses in Granada. Tourism and Hotel and Catering Trade Employers Federation. Granada Association of Tourist Guides and Tourist Information Workers. Association of Cultural Heritage Interpreters. Granada International Music and Dance Festival. Direccion: Cárcel Baja, 19 - 18013 Granada. More at the Granada festivals page. Mon. to Fri. 9am–2pm and 5pm–9pm. Dr. Martín Lagos 3, 1º C.
Plaza de San Cristóbal 3.